The driver of a van who was filmed splashing pedestrians on King Edward Avenue has been fired, according to Ottawa police and the company the driver worked for. The driver of a van who was filmed splashing pedestrians near the University of Ottawa has been fired, according to both Ottawa police and the company the driver worked for. 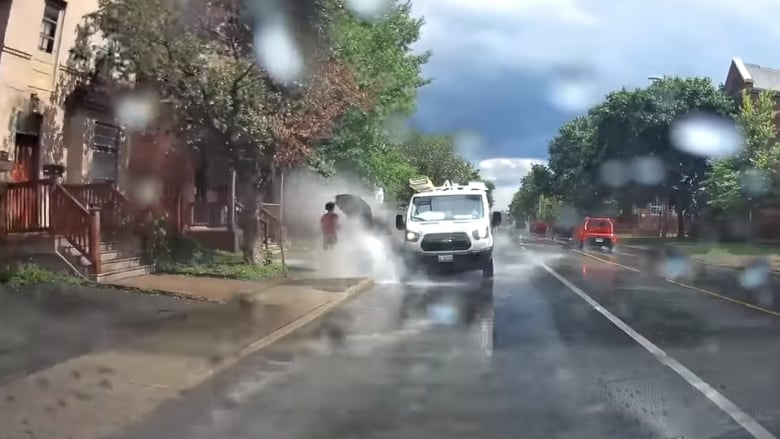 Dash cam video emerged online late last week of a white Black & McDonald van that appeared to be intentionally veering toward large puddles on King Edward Avenue and soaking people on the sidewalk. The 45-second clip, uploaded to YouTube with a July 27 time stamp, showed the driver splashing three sets of pedestrians. It had been viewed more than 600,000 times by Sunday afternoon. On Sunday, Black & McDonald issued an apology on its Facebook page about the "unacceptable" incident. "We apologize to everyone impacted by the recent incident in Ottawa of unacceptable driving by one of our van drivers," the contractor said. "We want to reassure the public that safety is our #1 priority. This is an isolated incident and the individual is no longer employed with Black & McDonald." Ottawa Police Service Sgt. Mark Gatien also said in a tweet that the company had "terminated" the driver. Police said Monday that the matter is closed and no criminal charges are being laid. CBC News reached out to the company's Ottawa branch this weekend, but as of Sunday afternoon no one had responded.